Display is 12 digits, "Nixie"-type tubes. Weighing only a little over 5 Ibs (2.3 kg), the ANITA 1212D measures 10.125"x9"x4.5" (268x226x110 mm). Wherever commercial applications predominate, the ANITA 1212D is claimed to give the user maximum economy (and the opportunity for a dramatic reduction in office costs) combined with accuracy, speed, ease of operation and an exceptionally wide range of applications. Latching keys provide sum of results and sum of first numbers; the free accumulating stores can also hold constants, and there is also a separate constant memory. Store contents can be freely manipulated and Stores I and II can be added to, or subtracted from, by direct entry or automatically on completion of calculations. A constant is held without affecting the normal full storage and calculating facilities. In percentage calculations, the automatic decimal point facility combines maximum ease of operation with total accuracy. Negative entry is facilitated by means of a "Change Sign" key and there is also an interchange key for adjusting factor order. A special "Inspection" key permits any result, no matter how small, to be recorded to 12 significant figures. Equally important in day-to-day routine commerce is the total freedom of the rounding features. To aid total accuracy, rounding is eliminated throughout intermediate results, thus obviating the risk of cumulative errors creeping into lengthy calculations. When rounding takes place at the Final Results stage, the user has a choice of rounding off (5/4), Rounding up or Truncated results, the last option giving choice of rounding results to 0, 1, 2, 3, 4, or 6 decimal places. The same machine, it is claimed, can be used with equal facility and the same degree of desired accuracy for such tasks as calculating bills of quantity and for executive discussions of estimated profit margins - where totally different degrees of decimal accuracy are likely to be required. 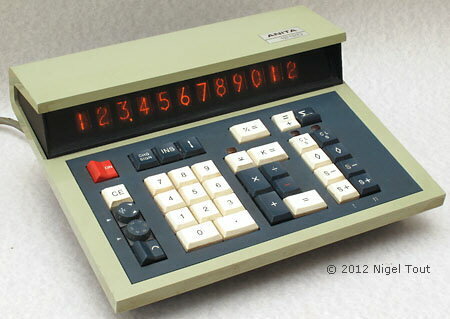 Further information from Sumlock Comptometer Ltd., Anita House, Rockingham Road, Uxbridge, Middlesex." 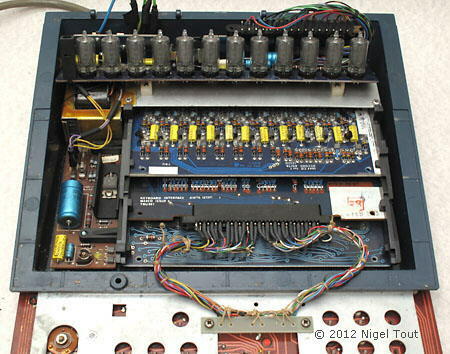 With the top cover removed, showing the "Nixie"-type display tubes at the top. 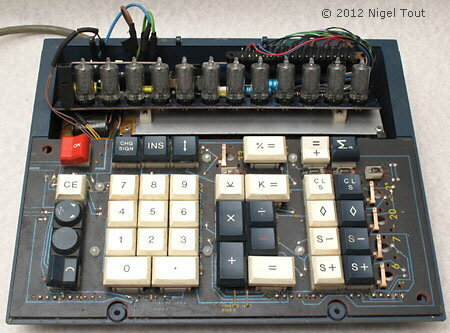 Removing the keyboard reveals the circuit boards.